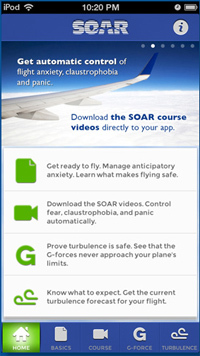 Get AirSafe.com's Fear of Flying Resources Guide. Often, the aviation safety experts point to the statistics associated with flying risk to show how flying is safe and that passengers should not be afraid. For most who have anxieties associated with flying, these statistics are meaningless because in most cases, the fear is not associated with flight risks. In other words, risk and safety are two different things, and you can't just use risk statistics to convince most people that flying is safe. Even if the chance of something bad happening is a million to one, most people are worried about whether their flight is going the be the one that doesn't end well. Licensed therapist and airline pilot Captain Tom Bunn offers a variety of fear of flying courses that can help you deal with the stress and anxiety that comes with a fear of flying. For a demonstration of the available products, click on the links or video demos below. To get additional air travel insights and resources please sign up for the AirSafe.com mailing list. On 16 February 1999, director Barry Sonnenfeld, whose films include Men in Black, Men in Black II, and Wild, Wild West, escaped injury when the Gulfstream II executive jet he was riding ran off the runway at the Van Nuys, CA airport, crashed into several nearby aircraft, and caught fire. Sonnenfeld and the three crew members escaped injury, but the aircraft was seriously damaged. After the accident, Sonnenfeld was quoted as saying that "The weird thing is that I hate to fly, and the quote that I give people is that every time I get off a plane, I view it as a failed suicide attempt." Note: The fear of flying may have one or more technical names, including aerophobia, aviatophobia, aviophobia, or pteromerhanophobia.